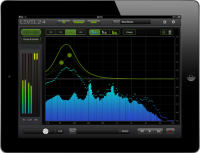 Level.24 is a pro-quality real-time spectrum analyzer, EQ, Compressor and Limiter. With up to 1/24 octave band analysis precision and 12 parallel parametric equalizers and ultra low latency, Level.24 redefines audio control on the iPad. 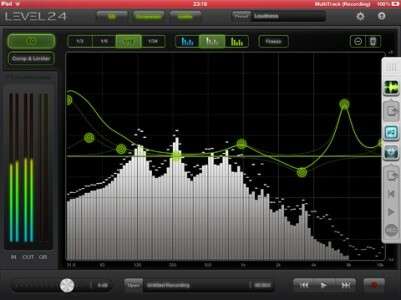 Fully Audiobus compatible to receive, process and record sound from other Audiobus apps. Level.24 helps you get perfect sound. In a live sound situation, a (home) studio or an Audiobus configuration, analyze the incoming audio to find peaks and dips and inspect the overall spectral balance. Shape the sound with up to twelve parametric EQ’s, and adjust the output levels with the Compressor / Limiter to add maximum punch. Input: microphone, external hardware, Audiobus. 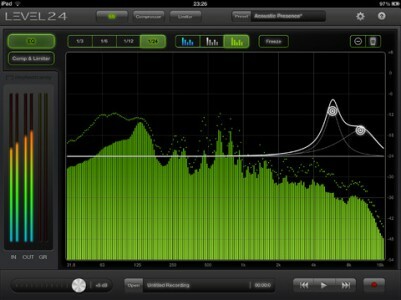 Real-time analysis: 3, 6, 12 and 24 bands per octave spectrum analyzer with average and peak display. 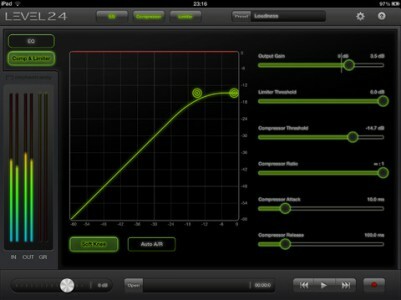 EQ: up to twelve parametric EQ’s in parallel, with adjustable center frequency, gain and Q factor. Dynamics: compressor with graphically controllable threshold and ratio, 10 dB soft-knee mode and switchable Automatic Attack and Release. Peak Limiter. 32-bit floating point internal signal bus. Ultra low latency mode with 1.5 ms delay. Recording: uncompressed recording and playback; EQ and dynamics stages can be applied to playback as well. This is another great app by ElephantCandy! 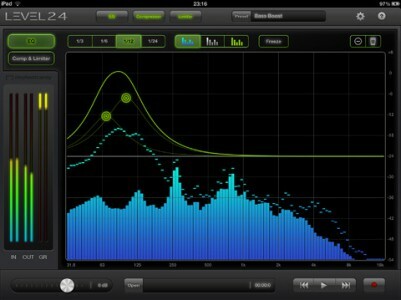 To add points double tap, to adjust Q select a point & pinch – works great & is excellent in audiobus. I am glad I got it finally and hope it serves a bigger part of my madness in creating music. If you have any comments, requests or bugs to report regarding Level.24, please contact us. Do specify the version of Level.24 (which you can find under the info menu), as well as the iOS version you are using.